UK Release Date - 4th July 1988. US Release Date - 27th August 1988. GER Release Date - 25th July 1988. Producer - Robert John 'Mutt' Lange/Def Leppard. Producer - Ronald Prent (Tracks 03/08). Live Tracks 03/08 - Recorded 25th June 1987 in Tilburg, Holland. Special Formats - Numbered Limited Edition 7 Inch Gatefold sleeve with 8-page lyric booklet. Special Formats - Numbered Limited Edition 'The Final Coming' Boxed Set. Boxed Set features the last four 12 Inch Hysteria sleeve sections to go with previous 5 UK 12 Inch single sleeves. The fifth UK single from 'Hysteria' was released in 1988. 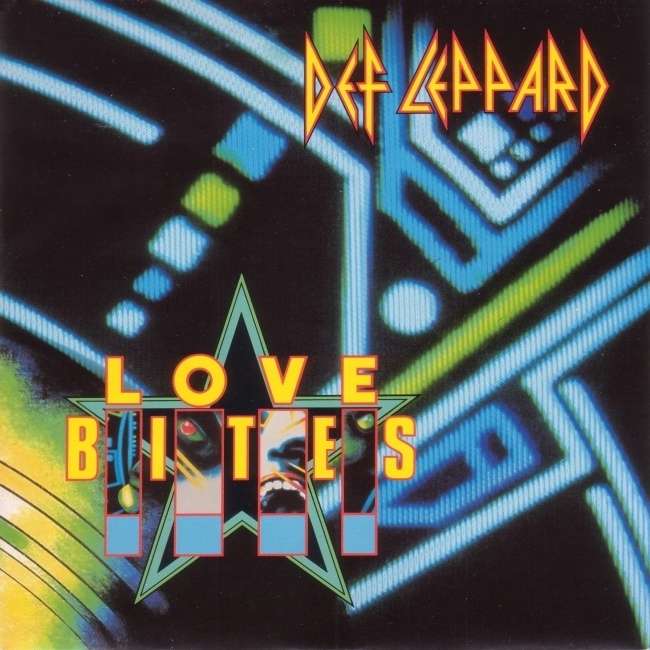 'Love Bites' was the second ballad released from the album and one of the biggest hits. It reached number 11 in the UK when released in July 1988. It also gave the band their first number one single in the US in October 1988 after it's release in late August, spending six weeks in the Top 10. When the single hit the top spot the album was at number 2. The single was advertised in the UK as the fifth and final single from the album. Including this single five sections of the album sleeve had been used as cover art. A special limited edition 12" numbered card box was issued called "The Final Coming", a jokey reference to the 'Orgasmic Mix' of 'Excitable' and it being the last (intended) single. Inside was the regular 12" plus four 12" x 12" cards. Each was basically the front of a 12" single without the back. They made up the last four remaining sections of the album sleeve with the Def Leppard logo in the top left of each. The cards were the top left, bottom left, middle right and bottom right sections. In other countries the middle right was the 'Women' single and the bottom right used for 'Rocket' (USA/Canada) or 'Rocket/PSSOM' (Germany). The top and bottom left sections were not used on any single covers. The single featured another live track from Tilburg and two remixes. The long version of 'Rocket (The Lunar Mix)' on CD and 'Excitable (The Orgasmic Mix)' on the 12". Other edtions included a numbered Gatefold 7" with the album lyrics. A CD Video was also issued. "The Final Single From The 'Hysteria' Album."